Great post! It's amazing how much farther food can really go when you get creative. I did not know that about sour milk... These days, with 4 boys in the house, milk doesn't sour too often, but it's good to know that I can use it in baking! Here's soemthing else I like to do to make the food go farther. Unfinished plates of veggies, chicken bones left from a chicken dinner, the ends of the onions and peppers left after chopping them, veggies getting past their prime - all go in my freezer in one glass container. Then, when it comes time to make stock I throw them all in to get great flavor in the stock. I didn't realize A Nation of Farmers was out yet. I'll have to check it out! I make (then can) soup with any leftover veggies. Canning (and freezing) is a great way to reduce waste. I also steam a lot of veggies and I always save the water runoff (there's a lot of nutrients there) from steaming to either use as a veggie soup stock or to cook rice. Lately, I've combatted waste by sharing the bounty with friends and neighbors. Those are great ideas! I'm bad about spoiled food... just now getting to a point where I will even THINK about eating an overripe fruit or veggie. I count the fact that I sliced up a wrinkled tomato for lunch yesterday to be a HUGE success! Honestly, my dogs eat most of the overripe/slightly off leftovers. I figure it's healthier for them AND for the planet, as I will buy just a little less prepackaged (but organic!) kibble. My dogs need to eat, just like me... and they love it more when it is "slightly gone"! Carmen: Love the stock idea. I do that too but need to be better about remembering to do it more often. Abbie: Yup. I do like it. Check your library. Ours had a bazillion copies. Heather: I should have known you'd have a load of awesome ideas on this topic. Love the idea of the water from steamed veggies. Great tips! I rarely have leftover veggies because we have pet rabbits. I usually add the few leftover veggies to soup. My family knows that if we have sloppy joes or spaghetti with meatsauce, a batch of chili is coming soon. They can predict banana bread, too. Mmm! Thanks for the sour milk idea. That's a new one. A couple things I do for the bottom of the crisper veggies is to make fried rice. It's accepting of most anything as long as I have a chile, soy and a nub of ginger. My other trick is omelets. That takes care of cheese, fresh or previously cooked veggies. Both are fast and easy which is the key at my house. No one in my house will eat bread butts, so I keep a container in the freezer for them. We use them whenever a recipe calls for bread crumbs, or we'll have french toast when the container gets really overloaded. Just curious - why did you think you wouldn't like A Nation of Farmers? I haven't read it yet, but it's on my reading list. The co-author Aaron Newton is visiting Raleigh in a few weeks. I mostly Menu plan but not down to the last item as I am known to change my mind ... Anyway I am often and usually making Vege stock from whats left in our winter crisper I freeze it in a couple of large portions for casseroles etc and a bunch in Ice cube trays to just add here and there to other dishes IYKWIM. Another thing I do with overripe fruit is to make fruit leather. Just toss it into the food processor or blender and into the dehydrator. You can also use your oven at the lowest setting. The kids think its candy. Daisy: LOL, that they can predict things. That's the sign of true organization on your part! Katrina: I love the omelets idea but I can never get my husband to eat eggs! Still . . . I'll have to try and sneak it in and also give the fried rice a go. I've actually never made that and I keep forgetting to do stir fry. Erin: I'm so stealing that idea for the bread butts! As to Nation of Farmers, I guess I find Sharon Astyk a little gloom and doom. I'm not saying she's not right but reading about it all the time definitely takes a toll. Tammy: I need to get better at menu planning and I definitely need to try your ice cube stock. The Mom: Fruit leather! That is brilliant!! Great ideas! I smoosh my bananas into a container like your friend, too! 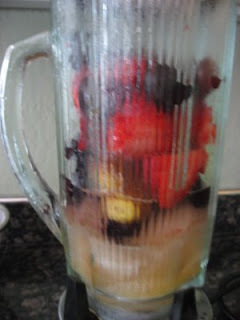 My husband hates smooshy fruit so I throw them in smoothies. One thing I started recently is saving the juices from oven and crock pot cooked meats - makes for an easy (already spiced) gravy.